At the age of 14 and standing 5 foot 10, Keladry of Mindelan is a squire. A squire serves and learns from a seasoned knight for four years, then faces a final test. That final test is the Ordeal, which takes place in a magical room called the Chamber. There, a squire encounters the parts of him or herself that the Chamber deems to be the most difficult to face—be they fears, failings, or unrepented wicked deeds. Does Kel have what it takes to survive? Absolutely love this series. Great for both young girls and boys. 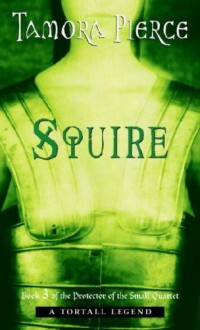 Squire is my favorite of the series - I love Raoul, who is so much fun as Kel's mentor, and I love how Kel's skills have grown and seeing Wyldon respect her.